Foreign investment in Australian houses surged 19 per cent last year with Chinese accounting for well over half of the total. 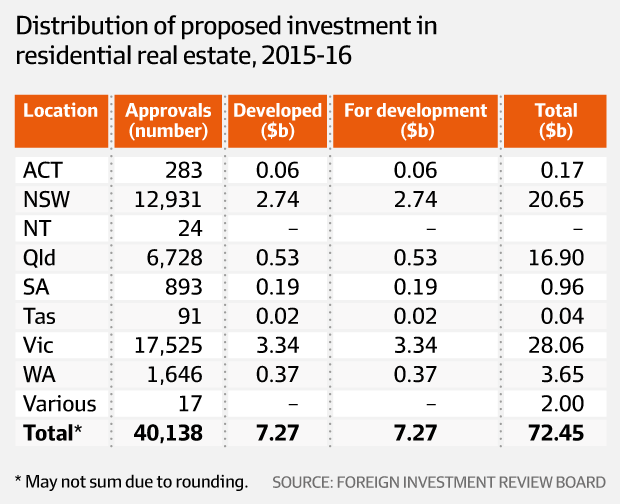 Foreigners were allowed to buy $72.4 billion of residential property in 2015-16 compared to $60 billion previously and the number of approvals surged 9 per cent to 40,100, according to the Foreign Investment Review Board’s 2015-16 annual report. The numbers will fuel a debate about the role foreign purchasers play in surging house prices especially in the overheated Melbourne and Sydney markets. Foreigners, who include individuals here on a temporary visa, applied to buy $20 billion of residential property in NSW, $28 billion in Victoria and $17 billion in Queensland. The FIRB report does not say how many of the foreigners who bought property were from China but it is clear they are the vast majority from an analysis of the total figure for all foreign investments, which includes residential property but also commercial property, farms, industrial and so on. Foreigners bought a total of about 43,000 Australian assets in 2015-16, about 40,000 for residential property and the rest for the other sorts of assets. 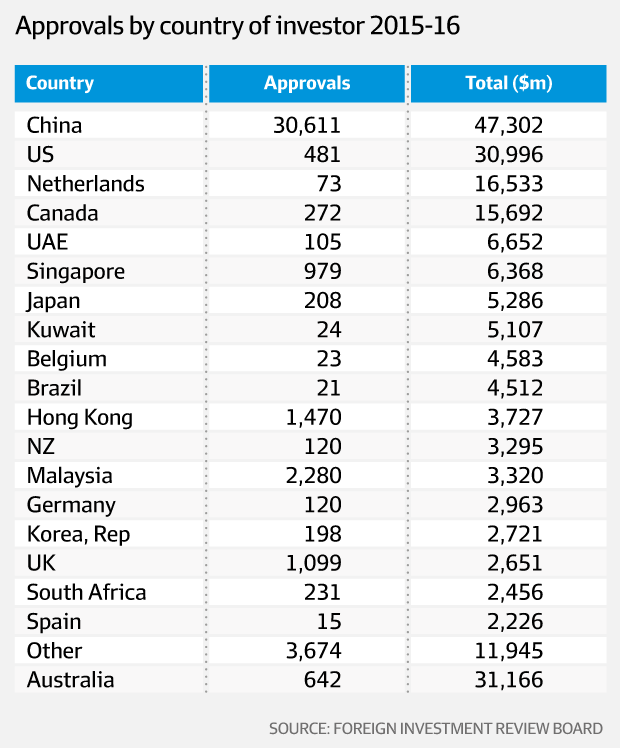 Of the total 43,000 approvals, 31,000 were for Chinese buyers followed by Malaysia, Hong Kong and then Britain each with 2000 applications or less. This implies the vast majority of the 40,000 residential property approvals were also for Chinese. The figures jar with state data fromNSW and Victoriawhich suggest Chinese account for about a third of all foreign purchasers, although the definitions of foreign residence are different between jurisdictions. The figures suggest that measures announced in early 2015 had only a marginal impact on foreign buyer demand. While then Treasurer Joe Hockey highlighted a case where he dobbed in a neighbour next to his own house in Sydney’s Hunter’s Hill and the property was forcibly sold, the report says that in most cases buyers were allowed to keep their houses. The FIRB report shows that a total of 2100 cases were investigated by the Australian Tax Office and 260 foreign house buyers were found to have breached the law but in all but 54 cases the sales were retrospectively approved or approved with conditions and the buyers were allowed to keep their houses. Only 15 houses were sold after a formal divestment order and another 39 sold voluntarily. Many of those who were allowed to keep their homes had broken the law restricting investment to new or substantially rebuilt. But FIRB said that “If an investor had applied for a variation to extend the required timeframe to develop land this would likely be approved if sufficient evidence was provided that the lack of progress was due to circumstances outside of their control”. Rule changes did, however, drastically cut the number of foreigners allowed to buy existing homes. The federal budget imposed new restrictions and taxes on foreign purchasers of residential property and NSW is under pressure to increase its 4 percent tax on purchases by foreign investors from 4 percent to 7 percent, the level set by Victoria. Overall China accounted for about $47 billion out of a total of $248 billion of foreign investment approvals across all sectors, followed by the US, the Netherlands and Canada.